Back in the 1930s the then Citroen director had a purist small car designed which was primarily intended for country people. Even before the war broke out this original 2 CV had been revised, but it was not shown until the post-war Paris Motor Show in 1948. The car driven by an air-cooled two-cylinder engine was convincing, mainly due to its robust and simple technology. In addition this car, of which over 3 million were produced, had suspension that enabled it to travel over the roughest track. 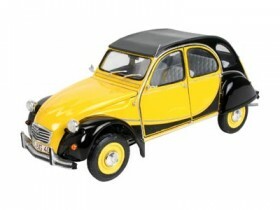 Production of the elderly 2 CV did not end until 1990 - after 40 years!